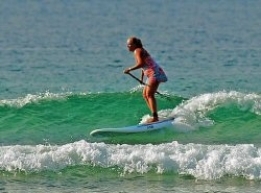 This SUP instructor’s course is to teach beginner SUP Surfing lessons. Learn how to manage students in the surf, risks and hazards, creating lessons plans, and techniques to have your students supping small waves with safety and ease. Deliver and instructor beginner stand up paddle (SUP) surfing sessions. free from strong rips, hazards, dumping shore break. offshore winds less than 10 knots/miles per hour. no more than 100 metres (320 ft) from shore. at least 100 metres (300 ft), downwind from lifesaving flags. Abide by student to instructor ratios: maximum of 1 student to 1 accredited instructor at busy surf locations. Maximum of 2 students to 1 accredited instructor at non-busy surf locations. Have at least intermediate SUP surfing skill and knowledge level. Able to perform bottom turn, top turn & cutback on forehand & backhand in 3ft surf. Hold or completing ASI Level 2 Stand Up Paddle Instructor (Exposed Waters) certificate. This intensive 1 day workshop will focus on completing the major components of the course. Some additional homework is also required to complete assessments and gain practical on-the-job instruction experience. Complete 25 hours assisting in beginner SUP surf instruction at an ASI accredited or other approved SUP school. (Exemption: recognition of previous experience can be provided). If you are not able to demonstrate competent intermediate SUP surfing paddling skills at the workshop, one additional video assessment can be submitted for free.